Welcome to the 2010 Summer Wrap Up edition of the Server and StorageIO Group (StorageIO) newsletter. With summer wrapping up here in the northern hemisphere it is that time of year to start thinking about fall. What that means is shifting from vacations and relaxations if you are or were able to do so to that of back to school shopping, fall projects and other work related activities. From an IT perspective, this means 2011 budget forecasting, perhaps IT resource capacity planning updates as well as other project planning activities. VMworld 2010 in San Francisco August 30 thru September 2nd marks the start of the fall conference, symposium and seminar season. Consequently this is a busy time of the year for me getting content ready for the various events, being briefed by vendors, vars and service providers of upcoming technology announcements, recording webinars, video and audio podcasts in addition to normal research and client advisory activities. This year has also been busy with the flurry of merger and acquisition (M and A) activity being led by Dell among others. Dell acquired Data Footprint Reduction (DFR) startup Ocarina and recently has been involved in bidding battle with HP over storage solution vendor 3PAR. Other summer M and A activity included Intel buying McAfee ($7.68B) following Symantecs spring acquisition of PGP and EMC purchase of data wharehouse firm Greenplum. Below are some links to blog posts commentary along with other industry trends and perspectives thoughts on Dell, 3PAR, Ocarina as well as IBM acquiring Storwize among other news. Meanwhile, in between normal client advisory activity and research, work continues on my new book which includes virtual storage, networking and cloud topics among other related themes. I will have more to share with you about the new book in upcoming newsletter editions. Enjoy this edition of the StorageIO newsletter and I look forward to your continued comments, feedback and discussions. Following the debut in the June Summer 2010 edition, the section covers emerging and common industry trends, issues or challenges that Im seeing or hearing while out and about in my conversations with IT professionals . Is Intel buying McAfee all about Hardware? I do not believe that Intel buying McAfee is about putting all of the security functionality into hardware chips. Granted as Intel is a hardware company there is a prevailing thought process that McAfee is destined to end up being a chip play. EMC a hardware company bought RSA a software security company and over time more of that acquired technology is ending up in hardware systems, however there is also a plethora of software being made available. Consequently in the case of Intel while I expect some of McAfee to be leveraged into hardware chips ranging from core processors to specialized chipsets, I also expect Intel to leverage McAfee as a software play both for virtual, cloud and physical services. After all, you can not have hardware without software, nor software without hardware even for virtual and cloud environments. Has FCoE entered trough of disillusionment? Yes, based on conversations with IT professionals, I believe that FCoE has entered the proverbial trough of disillusionment which is a good thing in that FCoE is also ramping up for deployment. The reason I think that it is good that FCoE is in or entering the trough is not that I do not believe in FCoE, rather, technologies go through a hype and early adopter phase before taking a breather prior to broader adoption. That is where I feel FCoE is at currently, taking a break from the initial hype, maturing while IT organizations begin planning for its future deployment. Thus the question around FCoE and its companion DCB should not be if, rather when, where, how and why. Thus I see FCoE as having a very bright future coexisting with other technologies including IO Virtualization (IOV) including PCI SIG MRIOV, Converged Networking, iSCSI, SAS and NAS among others. Are IOV and Converged Networking the same? Depending on who you talk to some position the many different variations of IOV along with converged networking and unified communications for that matter into the same context. While they are related and generally speaking complimenty, they play to different issues and roles. The trends that I am seeing with converged networking and I/O fall into a couple of categories. One being converged networking including unified communication solutions (UCS), FCoE/DCB along with InfiniBand based discussions while the other being around I/O virtualization (IOV) including PCIe server based multi root IO virtualization (MRIOV). Is FCoE a temporal or temporary technology? Data Footprint Reduction (DFR) is a collection of techniques, technologies, tools and best practices that are used to address data growth management challenges. Dedupe is currently the industry darling for DFR particularly in the scope or context of backup or other repetitive data. However DFR expands the scope of expanding data footprints and their impact to cover primary, secondary along with offline data that ranges from high performance to inactive high capacity. Consequently the focus of DFR is not just on reduction ratios, its also about meeting time or performance rates and data protection windows. This means DFR is about using the right tool for the task at hand to effectively meet business needs, and cost objectives while meeting service requirements across all applications. Examples of DFR technologies include Archiving, Compression, Dedupe, Data Management and Thin Provisioning among others. Read about DFR in Part I and Part II of a two part series found here and here. What are Hybrid Hard Disk Drives (HHDDs)? Hybrid Hard Disk Drives (HHDDs) are basically what their descriptive name implies. That is, they combine a traditional spinning magnetic Hard Disk Drive (HDD) with flash memory found in Solid State Devices (SSD) along with some amount of DRAM cache effectively providing three tiers of memory or storage in a single device. The value proposition of these devices is that of leveraging the high capacity and relative low cost of an HDD compared to a SSD, with the performance benefit of some flash and DRAM vs what is found in a traditional HDD while remaining plug compatible with existing laptops, PCs, servers and storage controllers. An example of an HHDD is the Seagate Momentus XT such as the 500GB 7,200RPM 2.5" HDD with 4GB of flash and 32MB of DRAM. Read more about HHDD in one of my blog posts found here. Since some of the above are new or emerging they may not yet be covered or discussed in other venues, research, surveys, studies or reports. Some are emerging trends perhaps even short lived while others will have longer legs to evolve. Thus do not be surprised or alarmed if there is something listed here or in one of the subsequent series of post that you have not seen or read elsewhere while others may already be familiar. Post: EMC and NetApp: On Parallel Tracks? It has been a busy summer in the office, on the road as well as at home. Some results of this recent activity have appeared in the StorageIOblog, on the main web site as well as via other sites and venues. Activity or content ranges from Industry Trends and Perspectives (ITPs) white papers, reports, blogs, commentary, interviews, Internet TV, videos, web cast, pod casts, ask the expert (ATE) questions, twitter tweets, tips and columns. There were also many in person presentations, key note and seminar events, briefing sessions along with virtual conferencing and advisory consulting sessions (read and see more here). Speaking of books, The Green and Virtual Data Center (CRC) is now available on Amazon Kindle (click on links below) as well as having been translated for publication in China. Some cities that I have visited while out and about so far this year doing keynote speaking, seminar along with advisory consulting events have included Minneapolis, Miami, San Diego, Beverly Hills, San Jose, San Diego (again) and Hollywood (again). There was Austin, Miami (again), New York City, Reston, Minneapolis (again), Irvine, New York City (again), Boston, Toronto, Atlanta, Chicago, Columbus, Philadelphia, Mountain View, Mahtomedia (Minneapolis area), Boston (again) and Indianapolis. These were followed by Calgary, Jasper (Alberta) and Vancouver before crossing the pond for a couple of days Nijkerk (Netherlands) for a one day Industry Trends and Perspectives seminar. While there was some breaks from travel during the summer months, other cities visited included Stamford, Cleveland, Miami (again), Tampa, Louisville and Toronto (again) not to mention changing planes in Atlanta, Detroit, Memphis and Las Vegas. Airplane travel as part of out and about should be obvious, however what about automobiles you may ask? After flying into Indianapolis there was an automobile ride to the Indianapolis Motor Speedway (IMS) where I did a keynote (BC, DR and HA) for a CDW sponsored event in gasoline alley a few days before the Indy 500 race occurred. Speaking of automobiles, racing, HA and technology, if you have not seen it, check out a post I did about what NAS, NASA and NASCAR have in common. What about trains you may also ask? Besides the normal airport trams or trains, there was a fun Amtrak Acela ride between New York City Penn station and Boston after doing a morning keynote speaking event in the city. Besides subway or commuter light rail in the US and Europe (Holland) other train activity included an overnight trip on VIA Rail Canada (the Canadian) from Jasper Alberta to Vancouver. If you have never been to the Canadian Rockies, let alone traveled via train, check this one, I highly recommend it. On a lighter note, what would summer be with out some boat activity? There was the Boston water taxi to Logan Airport from the convention center where EMCworld was held. However most boat activity has been so far relegated to relaxation. As all work and no play could make for a dull boy (or girl), I can update you that the out and about via boat fishing and sightseeing activity has been very good even with high (then low, then high, then low, then high) water on the scenic St. Croix river. In the spirit of exchanging information, this section features a different site in each edition perhaps even some that you have not seen or heard about. The featured site for this edition is Enterprise Efficiency where I have a blog post about availability or lack there of along with aging infrastructures. Have a look here. External SAS Direct Attached Storage (DAS) solutions enables multiple standalone or clustered physical and virtual servers to accomplish what is often thought to be exclusive to iSCSI, Fibre Channel or FCoE SANs and NAS systems which is to provide access to shared storage! 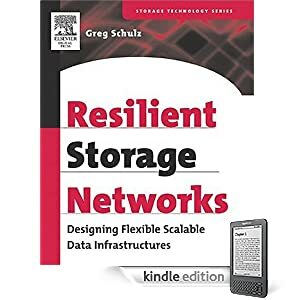 News: The Green and Virtual Data Center (CRC) is now available on Amazon Kindle joining Resilient Storage Networks (Elsevier) previously available. Watch for news and information about release of new Chinese language translation of The Green and Virtual Data Center (CRC). In addition to contributing, collaborating and co-authoring on other projects, Greg Schulz is the author of two books "The Green and Virtual Data Center" (CRC) and "Resilient Storage Networks - Designing Flexible Scalable Data Infrastructures" (Elsevier). Learn more about these books, what they are about, what is inside of them, reviews and commentary along with where to buy them. Information privacy is important to us. StorageIO does not sell, share or rent any personal information about you that may be collected while you visit our web sites. Our disclosure and privacy pages were updated in July 2010. Click here to view the disclosure or here for the privacy statement pages.